With about a week to go before the end of the year, 2013 is being hailed by critics across the board as a good year for music. We saw the emergence of new, promising artists like Haim and Lorde, and saw great followups by established acts such as Arctic Monkeys and Daft Punk. My Bloody Valentine made a reappearance twenty-two years (!) after their previous album, while Kanye West released a mad-hatter album whose hype rivals, if not exceeds, that which surrounded his blockbuster from 2010. Chance the Rapper and Earl Sweatshirt, too, released important rap albums. All in all, it was a good year for music. Here’s my take on the top five songs of the year. Hope you like it! There are a handful of songs in the world where all the elements – the music, the lyrics, the style and the influences – sync perfectly and irrefutably together. These songs are very, very few and far between, and are invariably propelled to ‘instant classic’ status. It can be said, beyond the shadow of a doubt, that “The Wire” is one of these songs. Haim, a trio of sisters from sunny California, has been making all the right kind of headlines since their debut Days are Gone released in September. Even though they have been compared to everyone from Fleetwood Mac to the Dixie Chicks, Haim has an unshakeable foundation which lets them use their influences as flavoring rather than as the main ingredient. 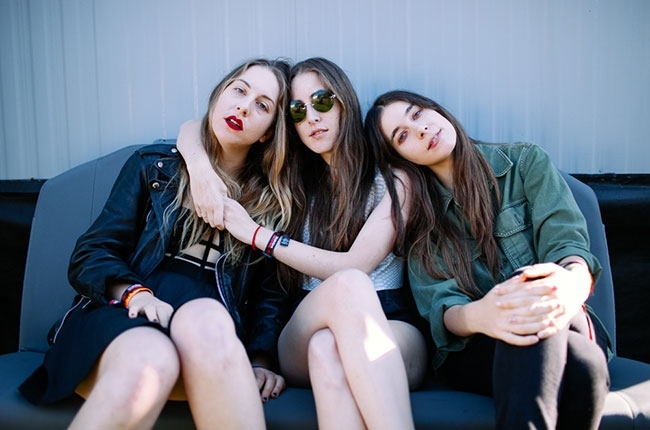 However you look at it, Haim is one of the most attractive and truly talented bands out there today. “The Wire”, a confessional about wisely letting go of a failing relationship, is an irresistibly catchy example of Haim’s allure. Existing in a universe where The Bangles open for Madonna (or maybe the other way around), “The Wire” is one of the best songs of the year and perhaps one that 2013 will be remembered for, well into the future. View our full album review here. In early 2004, a Scottish indie rock band released an eponymous debut album, smartly titled after a European archduke who catalysed one of history’s largest events. Fittingly, the album provided a similarly intense shot-in-the-arm for the indie rock world, which had been languishing since The Strokes released their unbeatable debut three years prior. Franz Ferdinand’s post-punk/steampunk hit “Take Me Out”, which was coupled with a video that showcased the band’s monstrously creative art-school sensibilities, remained the band’s song to beat. Now, almost a decade later, Franz Ferdinand has finally created a true successor to their best-known song – and man, it’s good. “Right Action” is an almost-love song (“Sometimes I wish you were here, weather permitting”) that paraphrases Buddhist tenets (“Right thoughts, right words, right actions”) over a relentless dance-party riff. It wouldn’t be incorrect to say that the song’s a riot and a half. The video, like all Franz Ferdinand videos, is mindblowingly artsy, and the boys are as slick and well-dressed as ever. Alex Kapranos has said that the band’s raison d’etre is to make music that girls can dance to. Franz Ferdinand may be a decade old, but you can bet your skinny tie that they can still own any dance party. 3. “Bad Girls” by M.I.A. 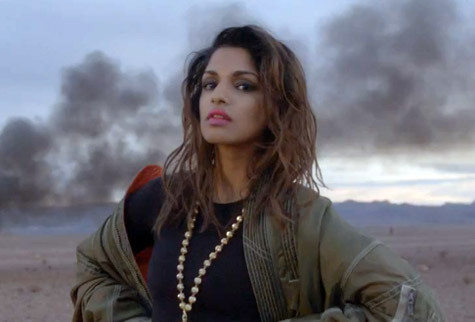 The implicit understanding that the video is taking place in Saudi Arabia – where woman drivers, let alone irreverent women atop cars, are forbidden – makes “Bad Girls” one of the rowdiest things that MIA has ever done. The song itself tilts, much like MIA’s cars, between exotic mysticism and gilded braggadocio, and in a way, it’s a metaphor for the artist herself. Whatever the angle, though, it’s just a ridiculously good song. Ironically aristocratic teenage sensation Lorde is, ironically, 2013’s It-girl. On “Royals”, her break-out, chart-topping lead single, Lorde sings about her inability to associate with the gaudy extravagance of popular musicians. “We don’t care, we aren’t caught up in your love affair,” she asserts, placing herself firmly in the zone of the non-celebrity. Over a deep-drum, threadbare beat, Lorde eschews the trappings of fame for a more localized aristocracy: “Let me be your ruler, you can call me queen bee,” she says. Ironically, though, this very song catapulted her into immediate pop royalty, charting her over self-indulgent pop mainstays such as Katy Perry and Miley Cyrus. Not bad for a sixteen year old, wouldn’t you say? “Get Lucky” was first released into the world through a 15-second advertisement on Saturday Night Live in early March. The rabid craze that followed that brief snippet foreshadowed the near future: a particularly enthusiastic fan even spun that 15-second sample into an extended 10-hour jam (!). At that point, the world didn’t even know much about the song – apart from a warm, glittering riff that somehow automatically brought to mind a disco ball. By the time Daft Punk released the song in April though, everyone knew all the words. It was, in mid-spring, already the song of the summer. “Get Lucky” is musical perfection enveloped in four minutes. It’s the reckless abandon on a disco dance floor. It’s the magic of meeting someone more promising than you’ve met in years. It’s the realization that love keeps the planet spinning, that music rebirths from itself like a phoenix. “Get Lucky” is a gift from a pair of robots to humankind, reminding us of a forgotten truth: that the past is golden and the future holds endless possibilities. In 2013, musicians around the world made music that impacted some of us in certain ways. In 2013, Daft Punk made a song that could – and should – eventually be sent out of our world into endless space as a symbol of what humankind can achieve… with a little help from robots, of course. So there you have it! Stay tuned for more Top Five lists coming up soon, including our Top Five Albums of 2013! What was your decision criteria for the list? Also, did you guys write anything on The National? I can’t seem to find anything. They could easily qualify to be in the top 5 albums of the year, even if no song particularly stands out. It was a personal Top Five list. Songs that kind of made my year. I want that M.I.A. song to be the soundtrack for my life. Also, Haim love is excellent. I was shocked by Franz Ferdinand over Why’d You Only Call Me When You’re High. Right Action was a fun video, but not as fun and the song was nowhere near as good. The top two though were nothing if not telegraphed. AM is a good album but Right Action is a better standalone single than anything on there, in my opinion. I did consider Do I Wanna Know/Mad Sounds, though. And yes, the MIA song is brilliant – almost as good as Paper Planes or Galang.